AquaRating is a system based on an international standard for the evaluation and improvement of water and sanitation utilities. AquaRating was originated in 2008 by the Inter-American Development Bank (IDB) and developed in close collaboration with the International Water Association (IWA), with the main goal of strengthening the water and sanitation sector around the world. The main users of AquaRating are water and sanitation utilities. Nevertheless, the system is also useful for other stakeholders, such as financial institutions, development agencies, regulators and public authorities. Evaluates the quality of the drinking water, the distribution process, the wastewater collection and the customer service. Evaluates the planning process, the asset management efficiency, the investments, the emergency plan and the research and development process. Evaluates the water resource management efficiency, the use of energy, the infrastructure management and the operational and maintenance cost efficiency. Evaluates the strategic planning process, the management control systems, the organizational structure, the human resource management and the procurement management. Evaluates the overall financial sustainability, the financial management, the billing effectiveness and the customer management process. Evaluates the guaranteed access to service, to drinking water and to wastewater collection. Evaluates the environment management; the availability of wastewater treatment infrastructure, the energy consumption balance, the greenhouse gas emissions and the compliance with environmental regulations. What is the minimum rate required for the AquaRating? The objective of the rate is to identify main gaps and opportunities for improvement in all areas of the organization. Therefore, the objective is to focus on the AquaRating process regardless of the rating obtained. What is the AquaRating Certification? The AquaRating Certification is an accreditation issued by the IDB and the IWA, which ensures that the AquaRating process has been completed by a water and sanitation utility after being audited by a third party. It has a validity of 3 years. How long does the AquaRating take? The time required to complete the AquaRating varies in each case, considering the availability of the information and the documentation required. 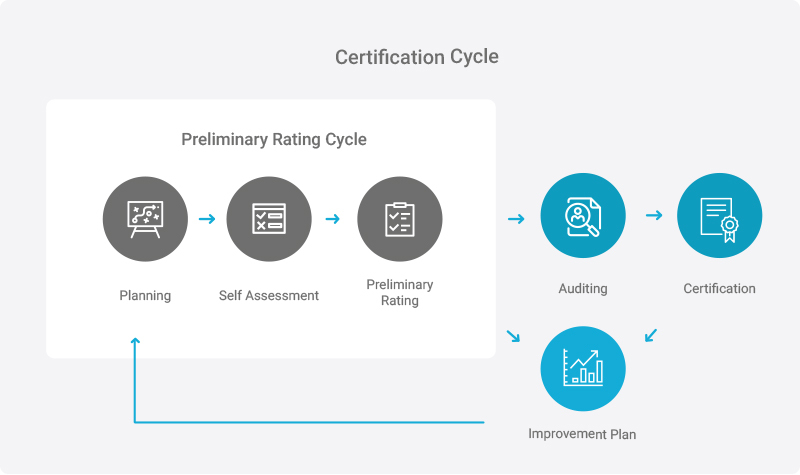 Generally, the Preliminary Rating Cycle can take from 3 to 4 months and the Certification Cycle from 6 to 7 months. How much does it cost to implement the AquaRating? An evaluation of each case is necessary to evaluate total cost of the process, as well as the financing mechanisms or subsidies that could apply in each country or region. When can I start the AquaRating? Where has the AquaRating been implemented? AquaRating has been implemented in countries such as Argentina, China, Colombia, Ecuador, Spain, El Salvador, Fiji, Sierra Leone, Jamaica, Mexico, among others. Where can I get more information about AquaRating?